Not since Arnold Schwarzenegger and Danny DeVito hit the road in Twins has their been a pairing like this! For the first time ever, comedy sensation Kevin Hart is taking on the role of the straight man to go toe-to-toe with the towering Dwayne Johnson in the new action comedy Central Intelligence. And from the opening moments of this new trailer, which just dropped from New Line, Warner Bros. and Universal Pictures, we can tell this isn't going to be like any movie either of these guys has ever done before! The story follows a one-time bullied geek, Bob, who grew up to be a lethal CIA agent (Dwayne Johnson), coming home for his high school reunion. Claiming to be on a top-secret case, he enlists the help of former "big man on campus," Calvin (Kevin Hart), now an accountant who misses his glory days. But before the staid number scrunched realizes what he's getting into, it's too late to get out, as his increasingly unpredictable new friend drags him through a world of shoot-outs, double-crosses and espionage that could get them both killed in more ways than Calvin can count. Central Intelligence also stars Amy Ryan, Aaron Paul, Brett Azar, Danielle Nicolet, Mark Burzenski and Bobby Brown. Bob is unlike any character Dwayne Johnson has played before, and offers the action star an opportunity to show his very funny side. About the role, he had this to say. "This is Bob. He's one of the most lethal operatives the C.I.A's ever had. Marches by the beat of his own unique drum. Loves Public Enemy, can drink Jack Daniels by the gallon and has a real fondness for unicorns. And the most important thing...Bob hates bullies. No seriously...He f*cks them up. Too much fun playing this character." 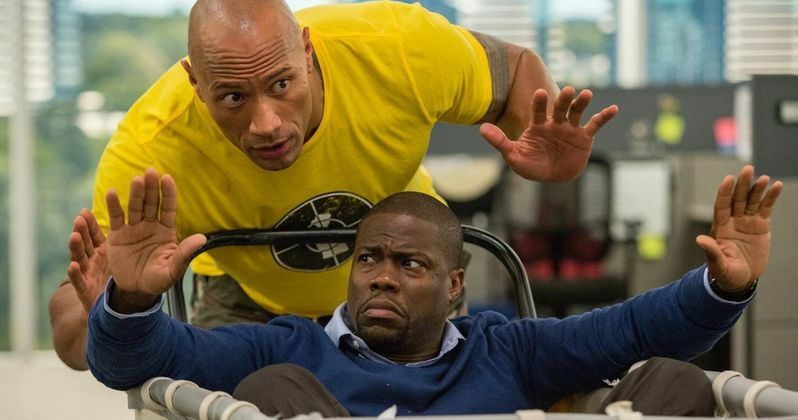 Dwayne Johnson, best known for his action-packed roles, will be providing most of the comedy in Central Intelligence, while comedic superstar Kevin Hart is playing it straight. As you can see in the trailer below, while Dwayne Johnson's Bob may be a massive covert agent, he's still a bit of a nerd at heart. And you're in for quite a shock when you see the opening shot! Take a look, and sound of in the comment section below. Will this be one of this summer's biggest hits?